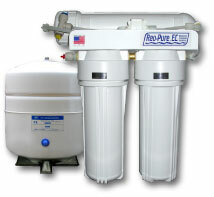 The REO PURE Model reverse osmosis water purification system is the best economy unit in its class. It uses no chemicals or electricity and provides very good water quality. This system hides away under your sink and puts healthy great-tasting water at your fingertips. It meets all your water quality needs at a fraction of the cost of bottled water; it costs about 7 cents a gallon to operate. Compare that to the price of bottled water, without having to carry home those heavy bottles of water. The undercounter water purifying unit is easy to install (usually takes about a couple hours). The system comes complete with a space-saving, 4.4 gallon storage tank and all the necessary fittings, including a long-reach chrome spout. For cold water use only. Maximum water temperature is 100°F. Maximum water pressure is 125 psi; minimum water pressure is 20 psi. The prefilter should be replaced every 6 Months-1 year. As little as a penny per gallon. it can save you money over bottled water. Better taste for cooking, coffee, tea and concentrated juices. Can be connected to your refrigerator's water and ice making dispensers. Excellent for city or municipal water. chemicals, low levels of bacteria and many other impurities behind. juices, soups, pasta. Ice cubes are clearer and harder and free of "funny taste"
Units include full size 10" sediment and carbon filters. Reverse Osmosis Unit with installation kit and tubing. 1 year warranty. ALPHA FEATURES METERS TO TEST YOUR REVERSE OSMOSIS PRODUCT WATER .